Aluminum window frames have great strength, are very durable, and are effective in blocking outside sounds. Aluminum is also a smart choice for historic window replacement since aluminum can easily be stretched to fit unconventionally-sized windows. Aluminum can be painted any color, is easy to clean, needs little maintenance, and is very resistant to cracking, breaking, and dents. Aluminum windows also have a long life expectancy, meaning they don’t need to be replaced often. Aluminum is a great choice for large commercial properties, while not recommended as much for small residential homes. 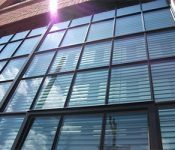 Aluminum alone may be less energy-efficient than other materials, but with the right thermal barrier and window glass, aluminum produces a highly energy-efficient window. Vinyl windows are a popular choice when energy-efficiency is a deciding factor. By design, vinyl frames are hollow and are most easily filled with insulation to increase energy-efficiency. However, vinyl can discolor when exposed to extreme climates. It can warp in severely hot temperatures and is usually difficult to shape. Vinyl windows cannot be repainted and generally are not considered as strong as aluminum. Wood frames are generally energy-efficient, however, wood does expand and contract over time. Wood can rot, crack or be infested by termites. Extreme heat can cause the wood to warp. Wood windows have a surprisingly long life, which is why many historic buildings have wood windows. However, unlike vinyl, which is almost maintenance free, wood will need regular maintenance to prevent any serious problems from developing. Still not sure what solution is best? We’re here to help. 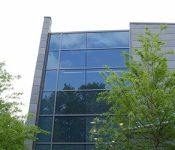 Contact us for a more in-depth discussion of your commercial window needs so we can find the best windows for your project.